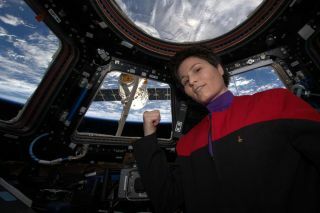 Star Trek fandom has gone orbital: European astronaut and Trekkie Samantha Cristoforetti, who is currently aboard the International Space Station, tweeted a photo of herself in a uniform from the one of "Star Trek" TV series. "'There's coffee in that nebula' ... ehm, I mean... in that #Dragon," Cristoforetti wrote in a Twitter post last Friday, as she looked out the window of the orbiting outpost at the Dragon space capsule that arrived carrying 4,300 lbs. (1,950 kilograms) of food, scientific experiments and other supplies. In the photo, Cristoforetti appears to be wearing a uniform similiar to those worn by actors on "Star Trek: Voyager," the fourth live-action TV series in the venerable science ficition franchise. The quote, "There's coffee in that nebula," comes from the early episode "The Cloud" and was uttered by Kathryn Janeway, captain of the USS Voyager, who was well known for her love of coffee: black. Cristoforetti's choice of words has a second meaning, because the Dragon spacecraft, built and operated by SpaceX, delivered a load of cargo to the space station that included the first-ever space espresso machine. Prior to the coffee machine's arrival, the only java option aboard the orbiting laboratory was powdered instant coffee. Cristoforetti has expressed her Star Trek fandom before — she tweeted a photo of herself giving the Vulcan salute shortly after Leonard Nimoy passed away on Feb. 6. Nimoy was best known for portraying Spock on the original "Star Trek" TV series and many subsequent movies. Accompanying that photo Cristoforetti wrote, "'Of all the souls I have encountered.. his was the most human,'" quoting a line from the movie "Star Trek II: The Wrath of Khan," that referenced Spock. "Thx @TheRealNimoy for bringing Spock to life for us."